Being a visitor to Southeast Asia (especially in Myanmar, Laos, Thailand and Cambodia), you’ll notice Buddhist monks wearing Orange Robes and an almost skin tight hair cut. Why you may ask? What does it both symbolize? 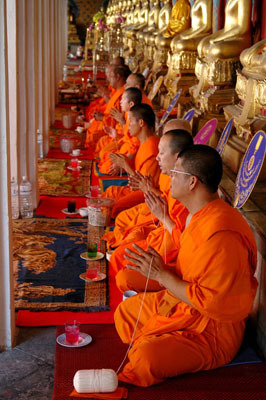 The saffron (for a more appropriate name for the color) robes monk wear dates back centuries. Orange was chosen mainly because of the dye available at the time. The tradition stuck and orange is now the color of choice for Theravada Buddhist followers in Southeast Asia, as opposed to a maroon color for Tibetan monks. The robes themselves are meant to symbolize simplicity and detachment of materialism. And what about the hair? Why is it shaved? A monk’s hair is shaved off so to symbolize simplicity and detachment of materialism. Yes, it’s as simple as that. How many times have you stood in front of the mirror and combed your hair? Or styled it? Or complained about a bad hair day? This is exactly what does not happen with a shaved head. Learn more about this religion with our Buddhism and Blossoms in Vientiane program in Laos. Some say Buddhism is more than just a religion, it is actually a philosophy of how to live a fulfilling life. Are you Brave enough to Fight through Thailand’s Scorching Mouse Dropping Chilies? The symbolism of orange color is related to the “hiranyamaya kosa” of the mind – which naturally fills the mind with a fiery saffron effulgence when all other desires have ceased in the intense desire for samadhi. It is the symbol of sacrifice and dedication to enlightenment. Not only Buddhist monks wear orange – it is the traditional color of yogic renuniciates. I am a yogic nun of Ananda Marga, and it is part of our uniform as well. I have heard on the other hand that the maroon color that Tibetan buddhists where is considered in ayurveda a “tridoshic” color that balances all types of consititutions. satisfieԁ that you shared this helpful info with us. Рlease keep us up to dаte like this. Thank уou for sharing. best site really helped made my life a LOT easier! thanks!